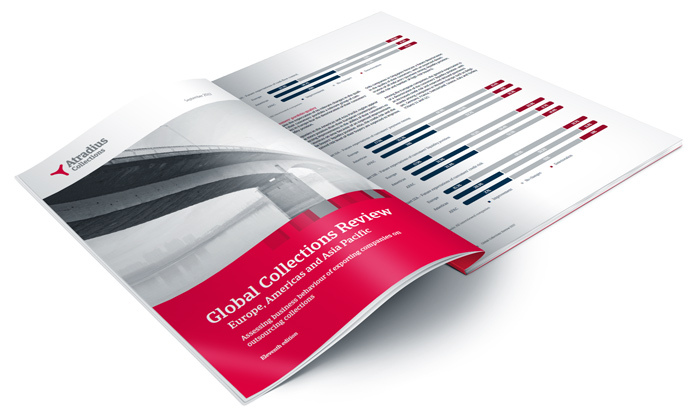 The Global Collection Review publication is based upon surveys of almost 6000 companies worldwide and assess business requirements for commercial collections services. Grouped by region the annual Review give insight into debt collection attitudes and practices in each area as well as issues that are likely to impact the future development of the market. The review looks at each region’s major economies and examines the collections behaviour of businesses and how they deal with overdue invoices. It also identifies local variations within each region, factors that influence companies’ selection of external collections partners and regional trends. Download your copy of the Global Collections Review now. What can you find in our Global Collections Review? The report covers 30 countries examining the collections behavior of companies and how they deal with overdue invoices, while also identifying the factors that influence the collection process. In addition, this ‘Review’ explores potential future developments regarding the services offered by debt collection agencies and the expectations of future changes in the buyers’ financial stability and in the quality of the overdue receivables portfolio. The tendency to trade on credit is a common practice adopted for both domestic and international B2B transactions. This section describes how delayed payments can impact business transactions as the longer the debts remain unpaid, the lower the likelihood to fully recover the outstanding amount. Companies try to recover their unpaid commercial debts using internal resources when they fail they will seek the assistance of external partners like debt collection agencies. In some regions internal collection is the most preferred method, whilst in other regions this is ineffective and companies prefer outsourcing . The GCR shows that debt recovery solutions vary among the regions. In some countries the professional service of collecting debts is still difficult to manage in others it is in a mature stage. Third party collection service, consultancy on legal collection and online access to cases are common, while in certain regions companies look for alternative collections services, including credit management training and online payment. The presence of overdue receivables has caused companies to postpone their own payments to suppliers, take specific measures to correct cash flow, to lose revenues and look for additional financing. In this section you will find what collection behavior companies will adopt in your region, among which are the use of credit insurance, checking the creditworthiness of buyers and monitoring the buyers’ credit risk. Companies in some regions expect improvements in the ability of their customers to pay invoices on time, in other regions companies forecast a future deterioration in financial security of their customers. Atradius Collections offers various options for your business credit management requirements. From collect letters send on your behalf, to one-off debt placement, all the way through to fully outsourced receivables in the name of the client. Our aim is to support you in recovering your receivables wherever in the world your invoices may be. Find out more about our services or contact us now.